The time is coming when you’re going to look up at the 60″ flat-screen mounted across from your desk and see the status of every job. When most companies figure out that something like this exists, it will be too late. The early adopters will already be the powerhouses of the solar industry. In each lead, get a continuous record displaying the full history, so you know who's done what. Add custom image types, upload and store them in your leads; do the same with documents. Create your own custom fields, add whatever info you deem necessary, to your lead form. 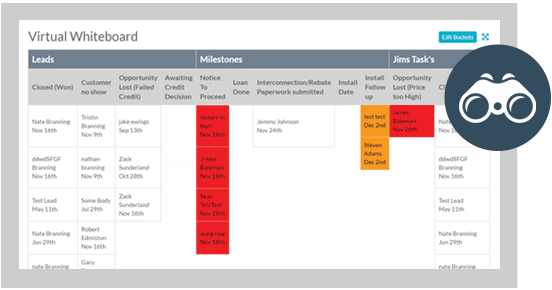 Know where your job is at any point in time, right from the lead with integrated milestones. Gather electrical usage and previous billing information directly from the lead form. Set appointments as needed for any position, reschedule and even confirm internally.